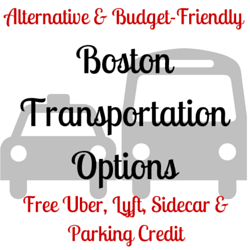 It’s always a good idea to have a backup option of budget-friendly alternatives just in case your original idea doesn’t pan out… or several, especially when it comes to commuting and traveling around Boston. Here is a roundup of promo codes for Uber, Lyft, and Sidecar for free credit. I currently have all three apps on my phone, but have only successfully taken rides on two out of three below and have had positive experiences. If you are not familiar with the three options below, (they are all fairly similar) you can hail a ride with the touch of your phone. These rides are typically in another drivers personal car but will be marked with a pink mustache (Lyft), a bag on the side mirror (Sidecar) and other ways. The app will also show the car make with a picture and name of your driver. Below are some promo codes for Uber, Lyft and Sidecar and are valid for first time users only– hopefully these promo codes will make a free ride for you! Lyft: $20 Lyft Credit with BOSBUDGET for a limited time only and then return to $10 credits for new users. *Please keep in mind that on-demand transportation app prices reflect the current demand, so if demand is quite large you will have to pay more than typical rates which would make it more than a taxi or other options potentially. Each app works a little differently but will let you know if it demand is more than usual. Also, if you are looking for a cheap car option, new ZipCar members can receive a free $25 ZipCar credit when you sign up! Let me know if there other cheap transportation that you recommend and use frequently. What is your favorite transportation app in Boston? What is your favorite ride-sharing company in Boston? Lyft, Uber, or Sidecar? *Please note: I have shared my referral links with you and will get credit/thank you for referring people to the options mentioned above; however, you are welcome to use another referral credit to receive free credit/free rides. If you are a current customer of any of the above, you can share your promo link with friends and family to get more credit as well. Happy traveling! There’s also SPOT for parking, cheaper than Garages, you can park at someone’s house and pay them through the app. Awesome way for people who live in Boston to make money while they aren’t home and a cheaper way to have a private parking spot if you’re heading somewhere. AND they have free parking every Friday too!